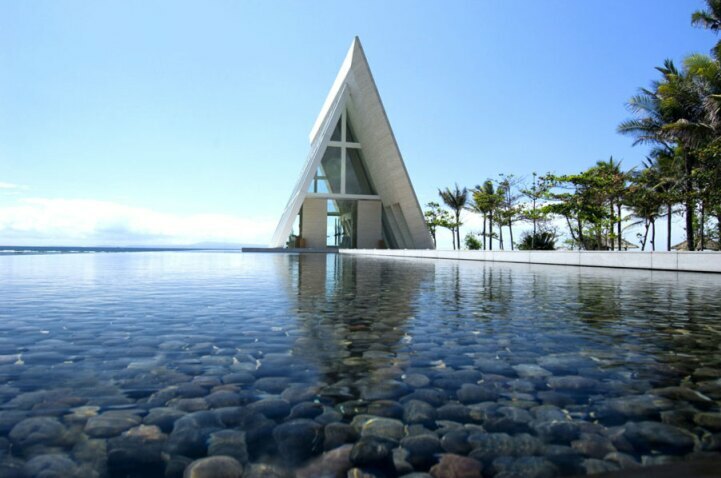 The Infinity Wedding Chapel at Conrad Bali. The resort is celebrating its 8th anniversary. The Conrad Bali is celebrating its 8th anniversary year with a series of events and promotions aptly themed with lucky number eight. In line with the strong feng shui element incorporated within the property’s gardens, pools and interior spaces, its three restaurants too have been carefully designed with balance, each offering not only unique atmosphere, but also great food. Honoring eight years of fine, authentic Balinese and Asian cuisine, Suku toasts the anniversary with a complimentary eight distinct “sambal”. Sambal is traditional Indonesian chili-based sauce, which varies in taste depending on its origin in the archipelago. Romantic eight-course degustation dinners are well suited for Eight Degrees South, one of Bali’s celebrated seaside bistros with indoor and alfresco seating. RIN, the resort’s Japanese specialty restaurant, will showcase eight varieties of noodle dishes. Known as yi mein and traditionally served on birthdays in Chinese culture, the noodle represents longevity and good fortune. At Jiwa Spa anniversary treatments are anything but ordinary. Treatments have been redefined extending massage sessions to 88 minutes and with celebration packages that include a glass of wine or, even a coconut and chocolate scrub and martini. Furthermore, the resort’s corporate meeting programs, “Smart Meetings – Reward Me,” promise an array of gift initiatives to clients who are booking company functions. Rewards range from spa treatments and Deluxe Ocean room accommodation on the first tier to iPads and the top prize of a Conrad Suite accommodation. Conrad Bali is a luxury beachfront resort located on the southern coast of Bali, an island in the Indonesian archipelago with an alluring blend of natural beauty and timeless traditions. Contemporary in design, the resort boasts panoramic views to the ocean, pools and gardens and features 353 guest rooms and suites, inspired dining options, extensive meeting, event, and leisure facilities including the Jiwa Spa. The resort is also home to a beachfront wedding venue, Infinity. The exclusive Conrad Suites is located on a private wing and offers enhanced privacy with personalized service. CONRAD® HOTELS & RESORTS is Hilton Worldwide’s global luxury brand and the choice for today’s modern, sophisticated traveler. By focusing on the individual, Conrad offers guests genuine and personalized experience and a world of style, service and connection. Each Conrad is a dynamic reflection of its city and culture, as well as a showcase for striking design and distinct surroundings. Across five continents, in the world’s gateway cities and most sought-after resort destinations, Conrad invites each guest to enjoy The Luxury Of Being Yourself®. For information on Conrad, visit www.conradhotels.com. The Breakers resort is making it easier for couples to enjoy a luxurious romantic escape and families to enjoy a winter getaway with the added savings of “Breakers Rewards,” its seasonal offer available through February 14, 2012, just in time for Valentine's Day © 2012 Karen Rubin/news-photos-features.com. The Breakers resort is making it easier for couples to enjoy a luxurious romantic escape and families to enjoy a winter getaway with the added savings of “Breakers Rewards,” its seasonal offer available through February 14, 2012, just in time for Valentine’s Day. • Children’s programs at the Family Entertainment Center. Complimentary resort benefits always include Internet inclusive of WiFi, access to main hotel’s fitness center and fitness classes (excluding private sessions). Breakers Rewards not available to groups. Other restrictions apply. The Breakers offers an alluring, domestic winter vacation in the style of tropical and Mediterranean destinations. This 140-acre Palm Beach resort, originally built in 1896, has undergone a comprehensive, $250 million revitalization and expansion over the past ten years, and today features a glamorous yet classic ambiance that combines Italian Renaissance style and European feel, with an alluring beachfront reminiscent of St. Tropez. The value of its proximity is palpable…a prime stateside location, more affordable than overseas, with stunning vistas of the Atlantic Ocean, easy air transit for guests and close airport proximity. With its bounty of dining and recreational amenities, The Breakers is a self-contained, panoramic escape, from which guests never have to step a sandal off property. One of America’s legendary resort destinations, this 540-room, Italian Renaissance-style hotel resides on 140 acres of oceanfront property in the heart of Palm Beach. The Breakers was founded in 1896 and is listed on the National Register of Historic Places, and continues to thrive independent of chain affiliation. Renowned for its gracious service, the resort indulges its clientele, whether couples on a romantic getaway, multi-generational travelers on a family vacation or large gatherings in celebration. With the commitment of its long-standing ownership, descendants of founder Henry Flagler, The Breakers invests $20 million each year in the property’s ongoing enhancement to ensure it remains appealing to future guests. Following a comprehensive ten-year $250 million revitalization, its timeless atmosphere — from its magnificent interiors to its artfully designed landscape — has been renewed in a style of relaxed elegance. A multi-faceted destination, The Breakers features 36 holes of championship Florida golf, including the Ocean Course and The Breakers Rees Jones® Course; 10 Har-Tru tennis courts; luxury spa; a breathtaking oceanfront with a half-mile of private beach, Mediterranean-style beach club, as well as luxury beach bungalows for daytime-rental, five pools, four whirlpool spas and a variety of water sports; a Family Entertainment Center and an extensive program of family and children’s activities. Nine distinctive restaurants, as well as an array of on-site boutiques, are all owned and managed by the resort. The Breakers is recognized as a AAA Five Diamond property and has earned numerous accolades for its commitment to the environment, community service and the quality of life it provides to its employees. 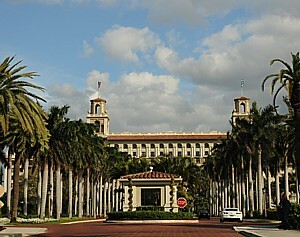 For reservations or more information, contact the resort toll-free at 1-888-BREAKERS (273-2537), (561) 655-6611, visit www.thebreakers.com, or contact your travel professional. 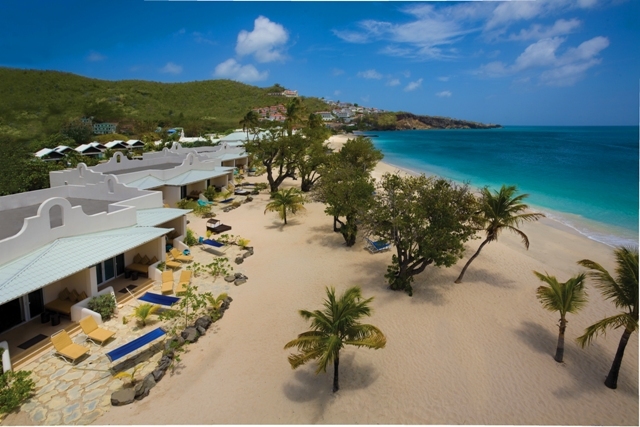 The launch of Caribbean Airlines non-stop service to Grenada twice a week from New York has sparked great interest in the destination’s premiere ultra-luxurious hideaway, Spice Island Beach Resort. 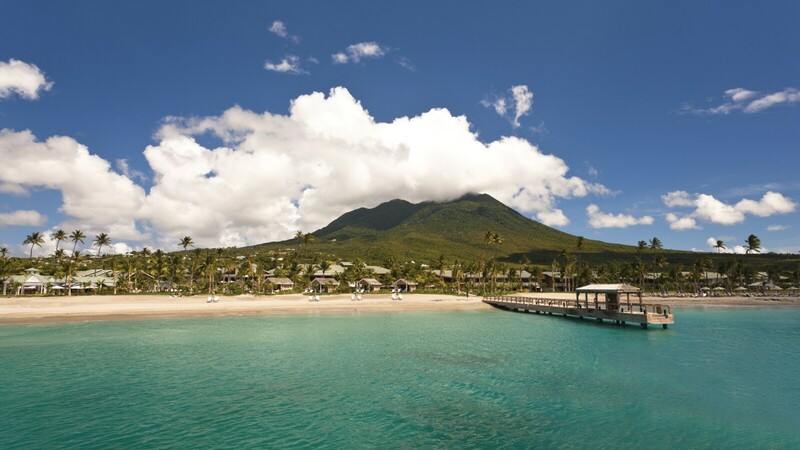 As a result, the chic property – which is also accessible from gateways nationwide through Delta and American Airlines’ hubs in New York and Miami – has extended its Escape to Spice Island Beach Resort promotion offering a $100 resort credit, per adult, for quests staying a minimum seven nights. The promotion is applicable to guests staying for seven nights or longer on the resort’s Fully-Inclusive Plan or Modified American Plan (includes breakfast and dinner) now through April 15, 2011. Resort credit can be redeemed at the resort’s boutique shops as well as the lavish 5,600-square-foot Janissa’s Spa. Offering manicures and pedicures, massages as well as body polishes and scrubs incorporating local ingredients like nutmeg, seaweed, aloe vera and coconut, the full-service spa also features a salon for hairstyling, waxing and other services, a sauna, outdoor Jacuzzi, separate men’s and women’s lockers, four air-conditioned treatment rooms with exterior rain showers, an outdoor sunken whirlpool bath, an open-air couples massage room, and a relaxation lounge overlooking a tranquil reflection pool. Additionally, guests who select the Modified American Plan can use their resort credit at the Sea & Surf Bar for cocktails or mid-day snacks as well as more elaborate lunch options at Oliver’s Restaurant and 24-hour room service (all of which is included at no additional charge for guests on the Fully Inclusive Plan). Unused resort credit will be refunded to guests at check-out translating to additional savings for guests who do not indulge in shopping or spa treatments. Tucked away on spectacular Grand Anse Beach, just 10 minutes from the airport, Spice Island Beach Resort is surrounded by pristine tropical gardens and offers a wide choice of suites, a culinary program that is a talking point of the island, a world-class spa and a relaxed, friendly atmosphere. The resort has received a number of recent accolades including Virgin Holidays’ “Gold Distinction” as the # 1 property in the operator’s Platinum Collection of exclusive hotels and resorts worldwide – an honor bestowed upon the resort for the last five years in a row. Spice Island Beach Resort was also voted “Gold” by the discerning readers of Condé Nast Traveler in the magazine’s 2010 Reader’s Choice Awards and has received the coveted AAA Four Diamond® Award for the past seven consecutive years. Attention to detail is found in each of the resort’s 64 elegantly appointed suites – which include six Luxury Almond Pool Suites and seven Anthurium Pool Suites. Suites are designed with contemporary Caribbean décor and feature a large whirlpool, LCD flat panel television with cable, Italian Frette bathrobes and linens (some of the softest and smoothest available), DVD and CD player with iPod docking station, Molton Brown bath and body amenities, mini-bar, ceiling fan, complimentary in-room Internet access, safe, coffee/tea facility, toaster, chaise lounges, patio or balcony, and other luxurious amenities. Taking advantage of Grenada’s abundance of exotic spices, local fruits and vegetables, Spice Island Beach Resort’s culinary program is one of the world’s finest. Oliver’s Restaurant offers an extensive daily table d’hotel menu with seven-course meals served in an elegant, open-air, beach front environment. To book the Escape to Spice Island Beach Resort offer, consult your local travel agent, contact Spice Island Beach Resort directly at 473-444-4258 or e-mail reservations@spiceisle.com. A minimum of seven nights must be booked to qualify for this offer. Click on http://www.spiceislandbeachresort.com/imagelibrary for pictures of the property. Visit http://www.spiceislandbeachresort.com/VirtualTours.htm for a virtual tour. For more information, contact Spice Island Beach Resort at tel: 473-444-4258, fax: 473-444-4807, e-mail: reservations@spicebeachresort.com, or visit www.SpiceIslandBeachResort.com.